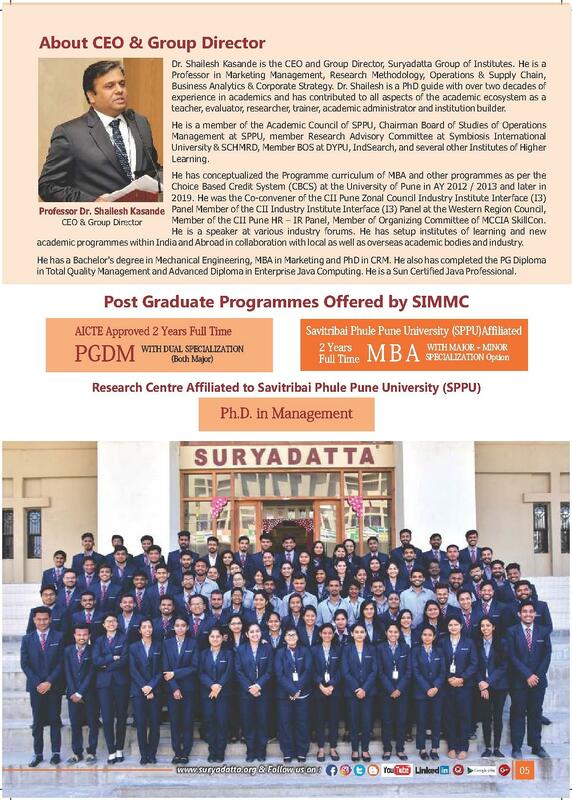 Suryadatta Institute of Management and Mass Communication (SIMMC) is a private institute situated in Pune, Maharashtra India. It is NAAC accredited college, affiliated to Savitribai Phule Pune University and approved by All India Council for Technical Education (AICTE) and Govt. of Maharashtra, recognized by Ministry of HRD, Govt. of India. SIMMC works with an aim to provide quality education with fabulous infrastructure. 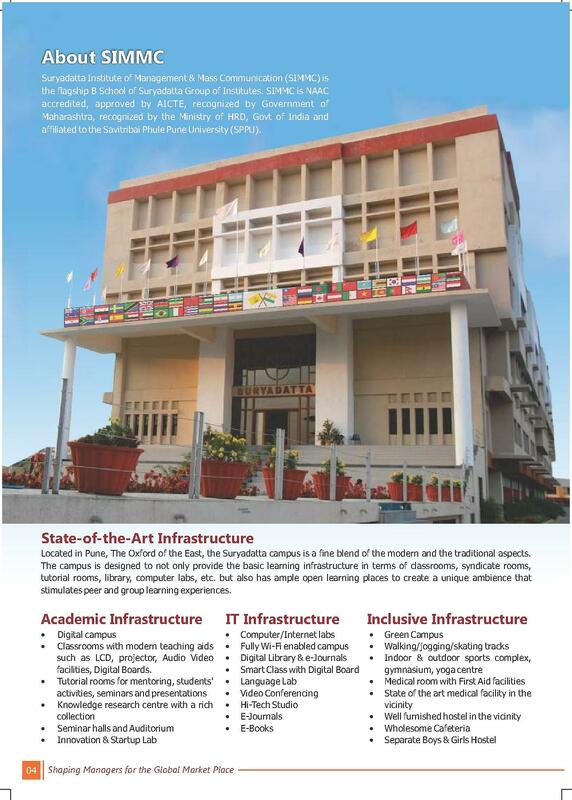 The institute offers PGDM and MBA Programs in various specializations. The institute also provides scholarships to meritorious students. 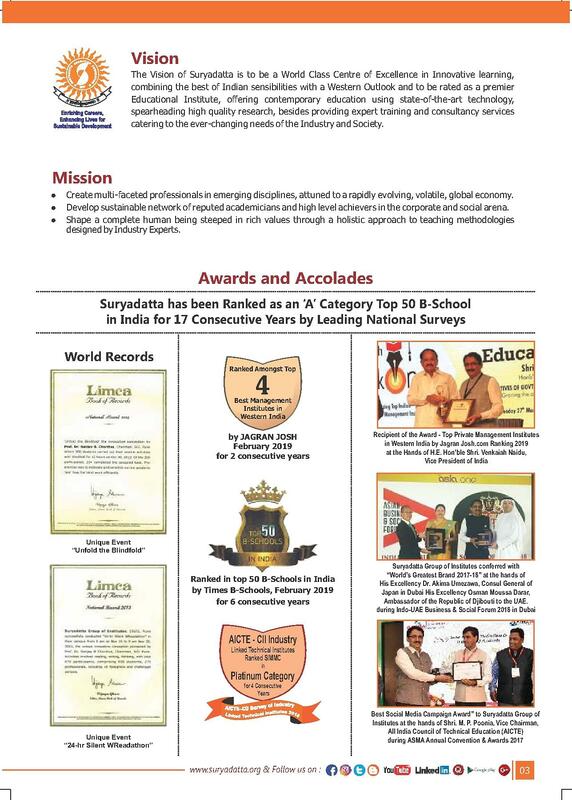 Industry experienced faculty, experienced academicians, case study & role play based teaching, seminars, guest lectures by industry professionals and incubation & research centre ensure Academic rigor and excellence at Suryadatta. Pre-placement Program: SIMMC offers preparation for Aptitude tests, Proficiency Test, Holistic Development Program (HDP), Personality Development Program (PDP) & Corporate Development Program (CDP), Employability Enhancement Modules. Extensive Industry Interface: Industry Visits, Guest Lectures, Seminars, Symposium, Conferences, Shadowing, Summer Internship Programs, Winter Projects, Final Placements. Placements: Multiple Career opportunities are given to Suryadatta MBA and PGDM Students till the time they get placed successfully. 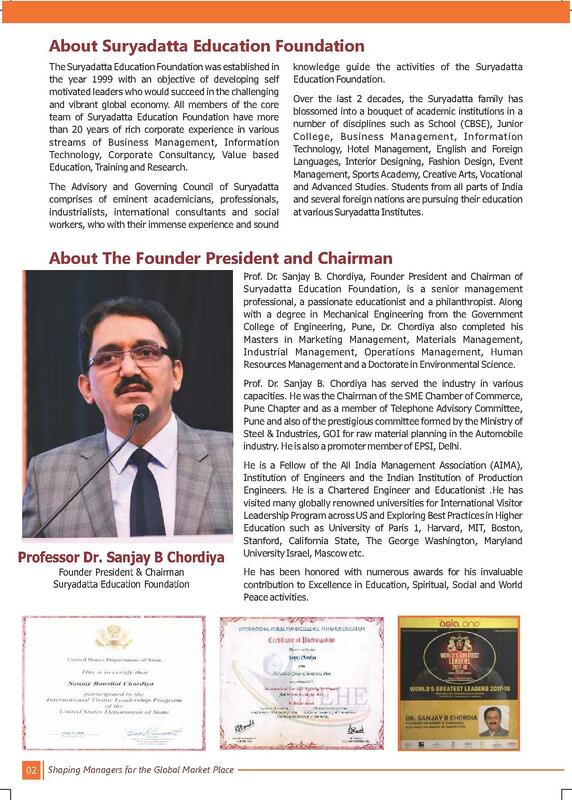 Suryans are working Blue chip national and multinational companies in India as well as in Dubai, Canada, UK etc. 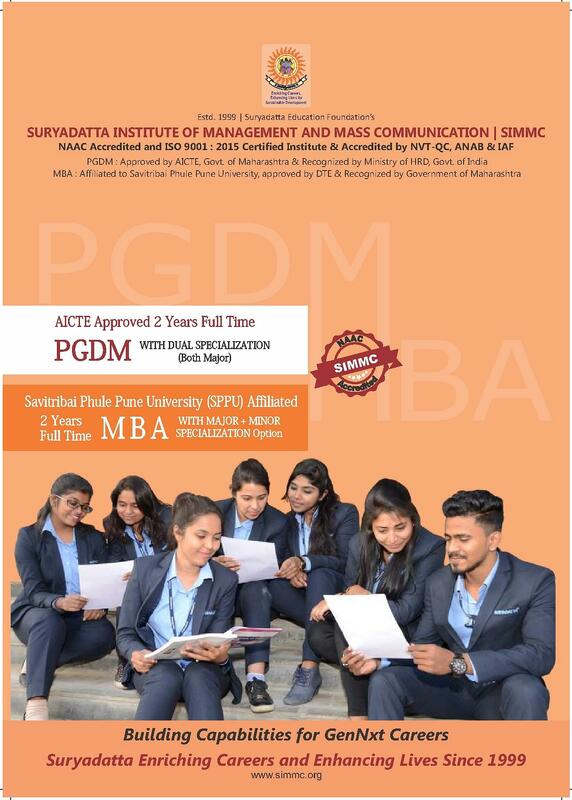 The institute offers 2 years full-time MBA program in various specializations .SIMMC also runs the PGDM program (Post Graduate Diploma in Management) with dual specialization (Both Major). The duration of the programmes is of 2 years each. MAHCET/ CMAT / CAT / XAT score and other exams as per DTE guidelines. The institute has separate a placement cell which gathers the best placement opportunities for its students. SIMMC provide summer and final placement assistance through its dedicated placement cell. All the deserving candidates get multiple placement opportunities. National and multinational companies from various sectors visit the campus for the recruitment process. SIMMC awarded best placement award for PGDM program. The placement package usually depends on overall academic performance, Graduation discipline, Course Specializations and performance at the time of Interview. ICICI Bank, Infosys, ING Vysya Life Insurance, ITC Ltd., Jaro Education, Tata Consultancy Service Pvt. Ltd., Tata Telecom, Times of India, Vodaphone, Wipro, WNS Global, XL Dynamics and many more. MBA course was good, we had many activities which helped me to enhance my knowledge and experience. We had NGO based project which actually let us visit NGO and research and study its working environment and methods. Through my course, we had industrial visit which also was good experience in my life.